AREA TEAMS INCLUDED: Lanier, Sam Houston. Sam Houston didn’t start the regular season the way it wanted to, or was expected to, but they couldn’t have finished it much better. The Hurricanes (12-13, 10-6), in their final District 28-5A game, accomplished two memorable tasks. They handed Lanier (21-12, 14-1) its first district loss and qualified for their 20th-consecutive playoff appearance in the bargain. Sam Houston, which reached the Class 3A state finals last year, established a commanding 17-6 lead in the first quarter and were prepared for the Voks’ response. 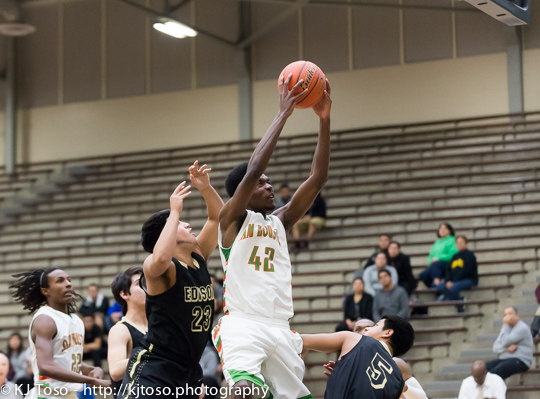 Lanier was within two points 6:11 from the end, but the Hurricanes rallied to win 72-60. They had lost their first six games of the season and their initial three district games to set up a long, hard climb. Lanier had already clinched its fifth-straight playoff bid as well as a first-place finish in 28-5A. The Voks had an 11-game winning streak. “A lot of people have told me one loss now isn’t really a bad thing,” first-year Lanier coach Joseph Martinez said. “I definitely didn’t let the kids know that. Sam Houston sped up Lanier at the outset to grab the double-digit lead. Jawon Anderson (15 points) and Robert Christian (11 points) each contributed four points as the Hurricanes ran off 12 in a row. Lanier regrouped in the second quarter, with guards Joe Soto (10 points) and Brian Laque (11 points) driving to reach the free-throw line. The Voks outscored the Hurricanes 24-15 in the third quarter behind three-point shooting from Raul Solis (15 points) and Luis Martinez (14). A three-point shot from Solis closed Lanier’s deficit to 57-55. Hurricanes defensive specialist Raymonte Prime scored the next four points, starting a 15-3 finishing run. It was punctuated by Allen’s dunk with nine seconds to play.